It's supposed to be a secret, but the ants come from a site in the Mojave Desert in California between Barstow and Victorville. You only get worker ants. The picture on the box always showed "brown" dirt, yet came with white sand (or at least all the ones I've seen). They still make these and still have to special order the ants seperately. My neighbor just got one for her daughter. Quite interesting to watch I must say. 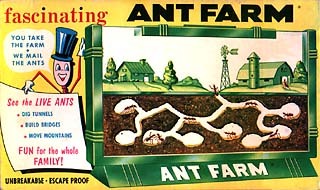 The ants didn't come with the farm. You had to special order the ants later or find some.